Product prices and availability are accurate as of 2019-04-14 01:09:15 BST and are subject to change. Any price and availability information displayed on http://www.amazon.co.uk/ at the time of purchase will apply to the purchase of this product. 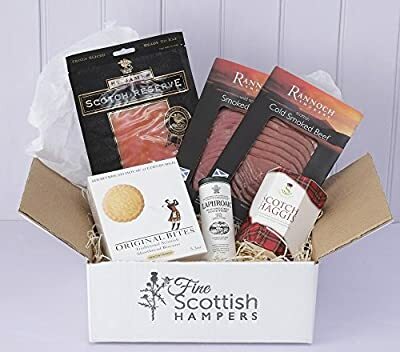 Introduce a special someone (or perhaps two) to some of the finest indulgences of Scotland, with this appropriately packed and prepared Scottish gift ‘Box for Two’. A mix of foods savoury, sweet and well-aged, as we’re sure you’ll agree the hearty taste of both the low and highlands is best experienced with another. Scotland’s smokeries are world famous, and from them we’ve plucked three fantastic examples of Smoked Salmon, Beef and Venison, each gently cooked to retain every ounce of flavour. They’re the perfect run up to a plate of Stahly’s Traditional Scotch Haggis, made to a family recipe with a blend of lamb, oatmeal and spices. Join it with a dram or two of Laphroaig’s 10 Year Whisky, and follow it with a few crumbly mouthfuls of classic Scottish Shortbread.